Maintain business continuity with our solutions for critical alerts & disaster recovery. Reliable Voice, SMS & Email solutions that help your business communicate in a crisis. Integrate the software your business currently uses for monitoring with our Voice or SMS API to enable automations to be sent out at the instant an incident occurs. Our range of SDKks will have you integrated in minutes. Create rules that push or route an automated Voice Broadcast or text message when an alert is required, aligned with the way you already work. Combine SMS, Voice & Email for intelligent alerts. Multi-channel contact doesn't have to be complex. Use a combination of SMS, Voice and Email to maximise the effect of your communications. 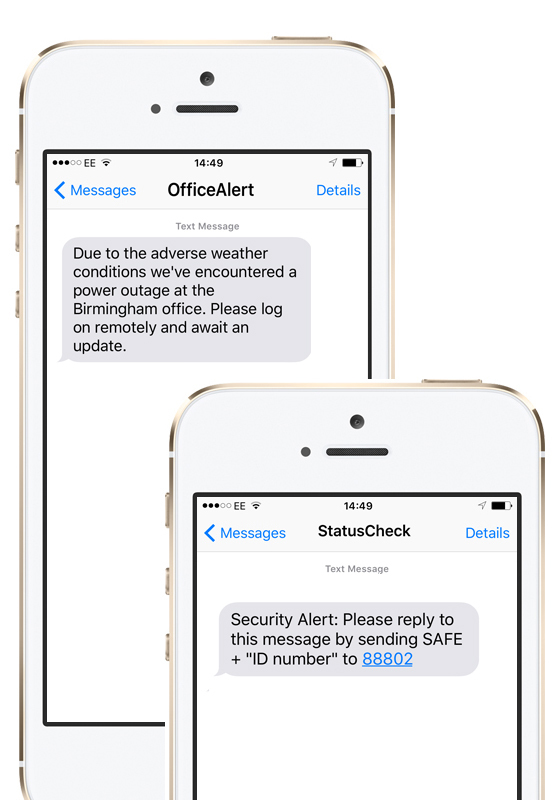 Broadcast a Voice message the moment an incident occurs, follow up with an SMS for instant updates on progress and send authorised and encrypted emails to follow up and event. Brand outgoing messages with your company's name so that your staff members know who is contacting them to attract faster replies. Alternatively, using long numbers or short codes enables your recipients to reply directly, opening up a two-way communication channel. An originator can include up to 11 alphanumeric characters. Mass notifications for crisis management. There is a need for speed when it comes to crisis management and there is no faster messaging solution then SMS. Enable responses in to engage in real-time conversations by SMS for your most common sales or support questions to free-up phone lines for high priority calls. Assign to specific teams or departments depending on their area of expertise. And combine with Voice when further engagement is required. Track & report delivery & responses communications. Reactions and perceptions during an emergency can change very quickly. Monitor SMS delivery and responses in real time enabling your business to act fast. Receive Push Notifications directly into your integrated app or software which tell you whether your messages have either arrived at its destination, failed to arrive or when you have received a message from somebody else. "Within seconds our security control centre gets a copy of the text as an email. Stewards and security are dispatched to bring the situation under control – all without anyone knowing who complained”." Intelligent multi-channel solutions that reduce risk. An important component to business continuity is the ability to communicate in a crisis. When an emergency occurs, communication needs to be immediate. Not only will customers want to know the impact but key stakeholders and employees will need to be alerted too. Using our multi-channel solutions; SMS, Voice, Email & Web you can develop a crisis communication and disaster recovery plan using the media that your customers and business use most. Esendex recognise that delays in maintaining service, security alerts and the absence of a continuity plan can considerably affect confidence in your business and incur cost. Continuity planning is all about identifying the parts of your business that you cannot afford to use and implementing a strategy that helps you resume operations as soon as possible and contact those at risk. Choose from our various product suite for the solution that suits you. "More than 50% of organisations experience an unforeseen disaster that affects BAU"
Only 20% of financial institutions use mobile messaging to ensure business continuity. 82% of organisations have been disrupted by major incidents caused by adverse weather conditions in the past 12 months.